These are the most impactful trendlines to monitor among the major asset classes. Every week on Twitter (in a feature we creatively call #TrendlineWednesday), we post some of the more intriguing and relevant trendlines that are in play across the financial markets. Some weeks, there are so many compelling trendlines in play that it is difficult to select which ones will make the cut for #TrendlineWednesday. Other weeks, it’s a strain to find any post-worthy trendlines in play. This week would fall into the latter category. So instead of necessarily picking the most relevant trendlines at the moment, we thought we’d review a handful of the trendlines with the potential to have the most impact on markets across the major asset classes. 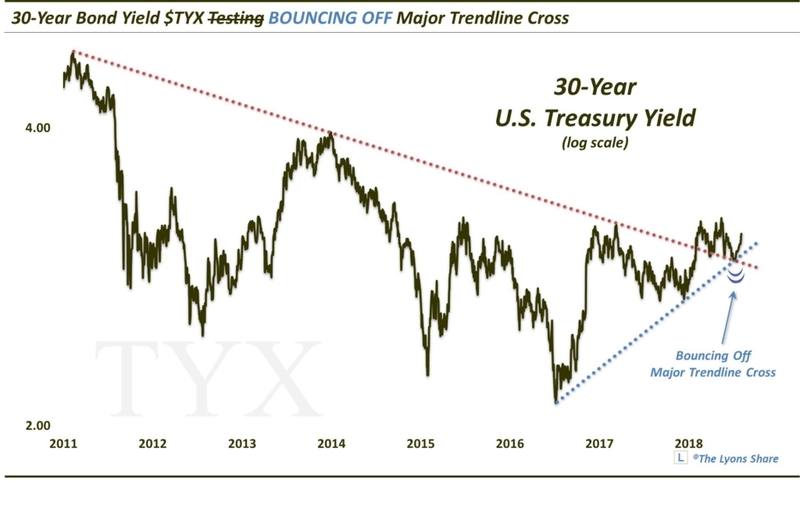 The first trendline comes from perhaps the most important asset on the planet in terms of its impact on other markets — the U.S. Dollar. 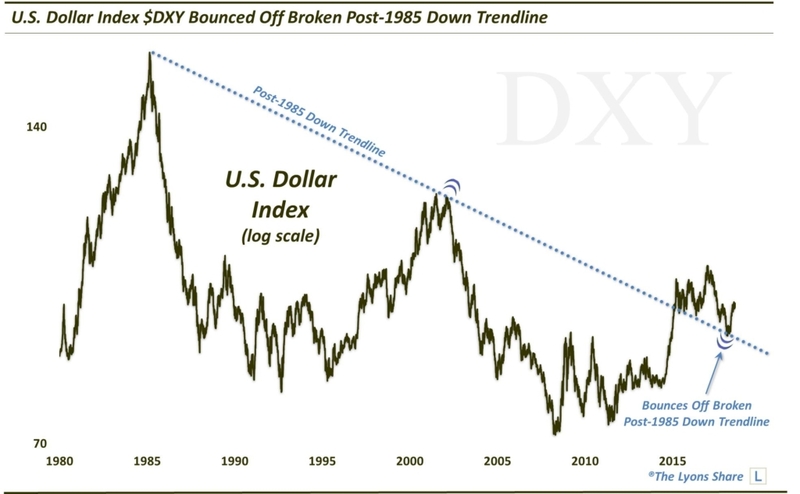 In this case, we are highlighting the U.S. Dollar Index which, as we suggested in a post back in January 2018 (Will The Buck Stop Here), is bouncing off of the broken post-1985 Down trendline. In bond land, as we noted in a recent post (Long Bond At A Crossroads [UNLOCKED]), in real-time, the 30-Year U.S. T-Bond Yield bounced off of its broken, regime-defining post-2011 Down trendline. 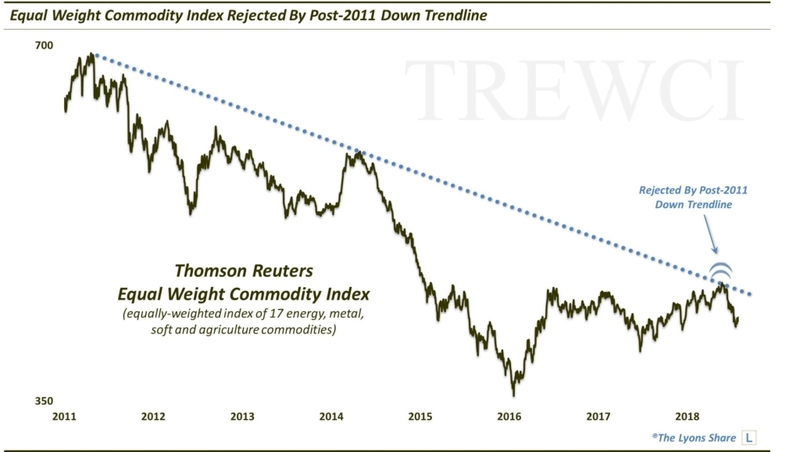 In the midst of a solid multi-year rally, we mentioned recently (The Next Big Move In Commodities [UNLOCKED]) that the broad commodity complex, as represented by the Thomson-Reuters Equal-Weight Commodity Index, was attempting to break its own post-2011 Down trendline. It failed. 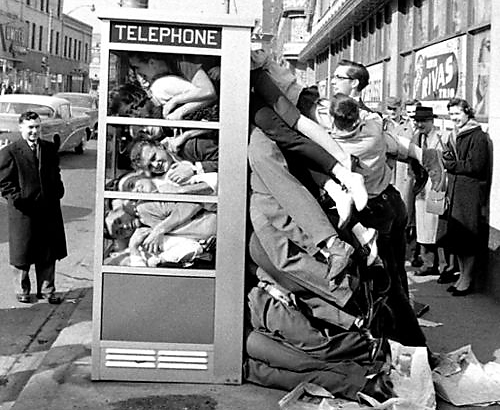 Finishing up in our wheelhouse, we take a peek at the equity market. 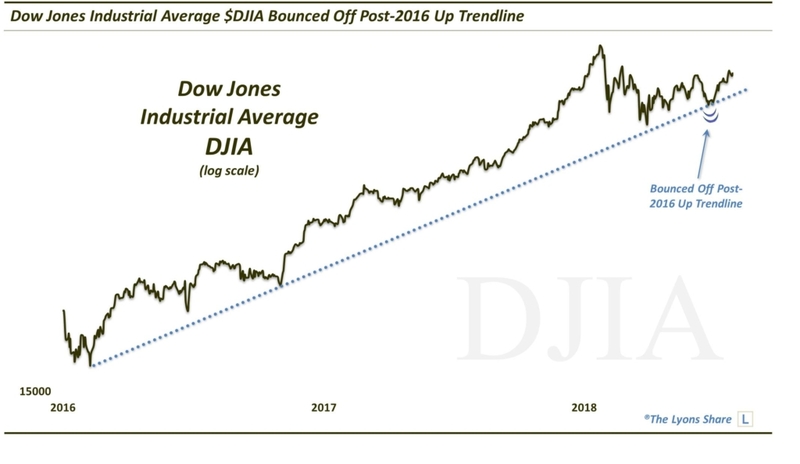 There are many important trendlines in the global stock market, but we chose to highlight the Dow Jones Industrial Average due to the clean trendline and its more immediate impact. Specifically, as we pointed out in a post in late June (Equity Bull Markets Toeing The (Trend-)Line), the Dow was testing its Up trendline stemming from the lows in early 2016. It passed the test. Obviously there are countless other trendlines that have the potential to impact the markets in a meaningful way. However, these are among the most critical trendlines in determining the direction of prices in the major asset classes. Monitoring them can help you stay on the right side of the major market trends. 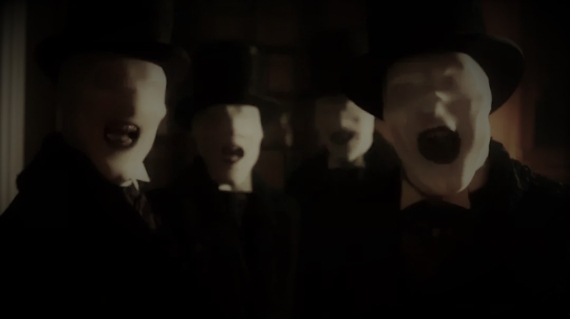 Then again, you can also just follow us and let us do the monitoring for you — we’re already doing it every day. 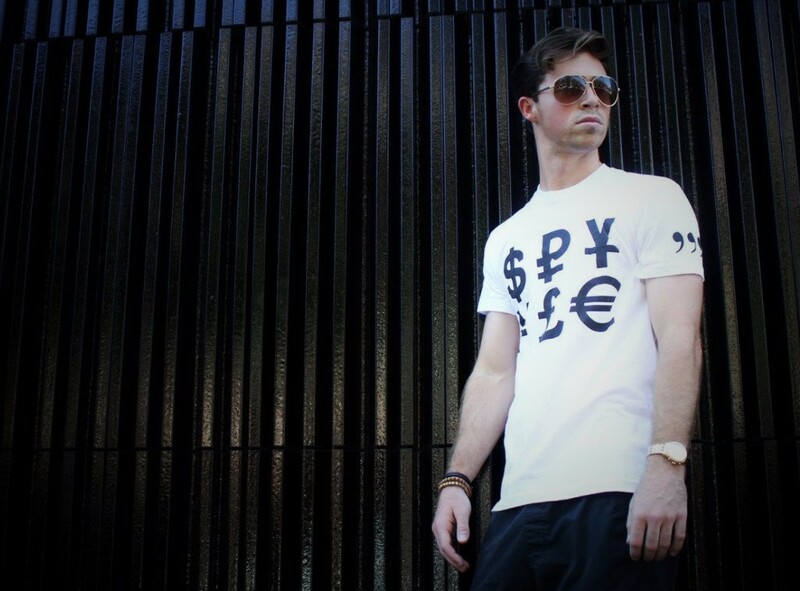 If you’re interested, please check out our new site, The Lyons Share. You can follow our investment process and posture every day — including insights into what we’re looking to buy and sell and when. Thanks for reading!